Last year we had our Official Music Videos for “Somewhere Over the Rainbow” and “What a Wonderful World” taken down from our YouTube channel. 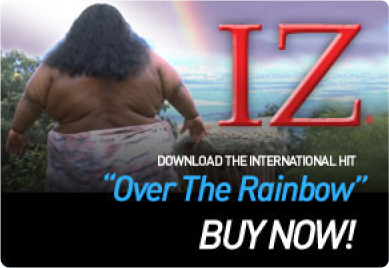 We are now legitimately back up and doing our best to catch up with the millions of views the other IZ videos have on YouTube. Enjoy and please share our videos with as many friends as you can! There are 8 comments on IZʻs videos are back up on YouTube! wonderful singer it comes from his heart,loves mother nature.may his soul rest in peace.god bless his family and his only daughter. I really enjoyed IZ”s videos. He was a beautiful singer and person. I have to get his CD’s to listen to when I am feeling a relaxing mood coming on. He has such a peaceful sound to his voice that gives me a great feeling. Love to his family. Happy to hear his videos are back on youtube for everyone to discover and hear! I love watching the video of Somewhere Over the Rainbow with my granddaughter but I don’t understand why this can’t be viewed on my iPad. Really? What’s the problem, must I carry around my bulky laptop? Please allow access. Thanks.